The 2018-19 season has been one to forget for the St. Louis Blues. 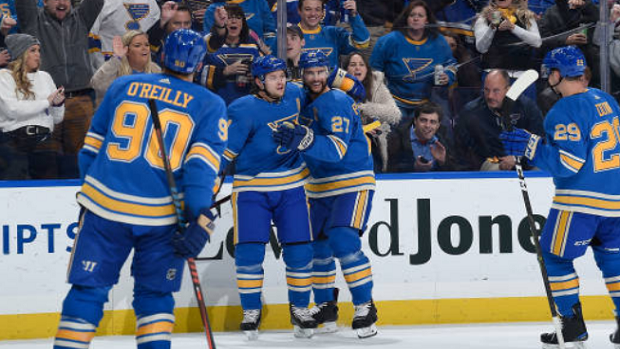 The team entered October with high expectations after trading for Ryan O’Reilly over the summer, but they haven’t been reached as the Blues find themselves second last in the Central Division with an 11-14-4 record. Rather than trying to rectify the issue this with his current roster, general manager Doug Armstrong is reportedly looking to shake things up. Blues insider Jeremy Rutherford joined 101 ESPN and revealed that "a couple General Managers around the league have said that they're hearing the big names are all on the block. Everything is open. Even Vladimir Tarasenko." The Russian is in the midst of a relatively underwhelming season. Through 29 games, he’s potted home just 9 goals along with 11 assists, second on the team in points behind O’Reilly’s 29. The Blues are currently tied for 27th in the league with 82 goals on the season. A year removed from missing the playoffs, change appears to be on the horizon in St. Louis. It’s rare to think that a player such as Tarasenko, a former 40-goal-scorer, could be on the move. Which team would be the best fit?